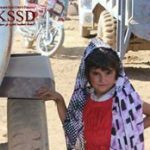 Thousands of families are stuck on the Turkish border | Kobanî, Syria – DOZ e. V.
Kobanî (Ain Al-arab), the City of resistance and withstand, thousands of its residents have fled the city and nearby villages fallen to the Islamic state in Iraq and Syria “ISIS” in the past two days to witness a large forced migration and an attempt of genocide of its people, and to be turned to a stricken city and a source of continuing alarm and tragedy that the most dramatic Kurdish refugee exodus is taking place now as many as 130,000 Syrian Kurds have fled in 24 hours the advance and the onslaught of Islamic State fighters from three directions(east, west and south), the number could double in the coming days. Children, women and the elderly were the victims of this onslaught to be suffered, deprived of peace of mind and haunted by fear. More than 35 thousand children are without food, drink and schools. Some of them are stuck on the border and displaced in the open-air and others didn’t find except parks and mosques to resort to as shelter. What have children done to be displaced, what was their sin to suffer and be deprived of their daily needs in these extreme conditions experienced by the entire country since more than 4 years. Our children are the candle of our dreams and the hope of the future of our nation, therefore we must protect them. Photos are taken from the Turkish border by the lens of “Ahmed Shekho”.